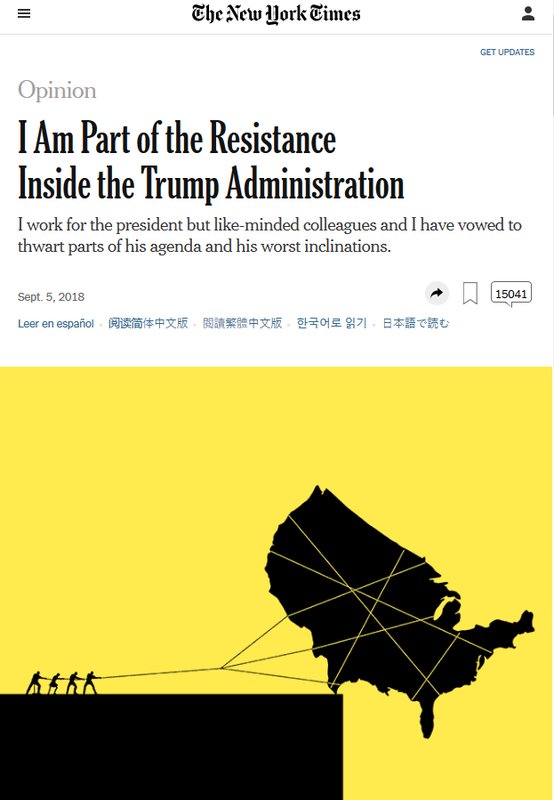 The anonymous New York Times op-ed (9/5/18), purportedly written by a senior Trump administration official, coupled with the release of Bob Woodward’s new book, Fear—itself full of White House back-stabbing and anonymous quotes—unleashed a veritable tsunami of breathless press speculation last week. But lost amidst the deluge was a Trump administration story that will have deadly, far-reaching consequences long after the Times op-ed is forgotten and Woodward’s book hits the discount pile. That’s because Trump effectively endorsed endless US war in Syria last week, and almost no one in the press noticed. President Trump, who just five months ago said he wanted “to get out” of Syria and bring US troops home soon, has agreed to a new strategy that indefinitely extends the military effort there and launches a major diplomatic push to achieve American objectives, according to senior State Department officials…. US forces are to remain in the country to ensure an Iranian departure and the “enduring defeat” of the Islamic State. This kind of open-ended commitment and nebulous criteria for withdrawal all but consign the US to Syria forever. And the stipulation of an Iranian departure from Syria as a necessary end-state for redeployment would seem to strip away any last veneer that the 2001 AUMF can be used to justify the US presence there. But these thorny questions were conspicuously absent from a press corps that barely noticed the sea change underway in our Syria policy this week. The Associated Press (9/6/18) also covered the story, but its effort left much to be desired. 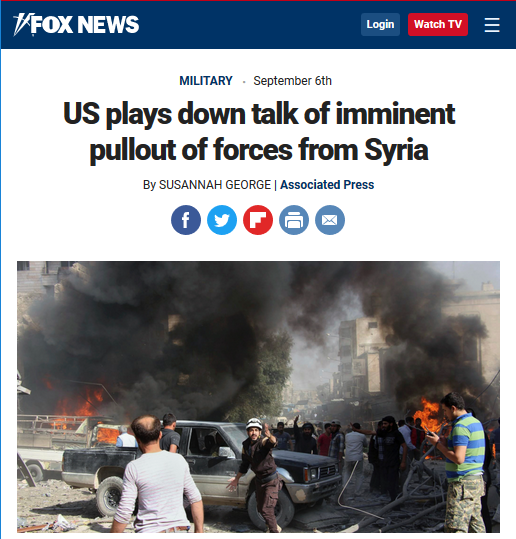 Its ponderous headline, “US Plays Down Talk of Imminent Pullout of Forces From Syria,” entirely missed the point of what this president had just committed to. Likewise, the article’s lead was a jumble of disingenuous and contradictory official statements that the reporter never bothered to deconstruct or challenge. 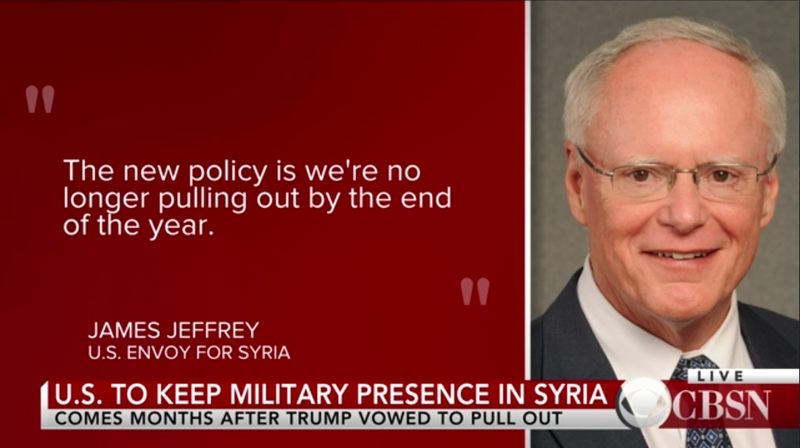 Instead, the AP allowed Trump’s special representative for Syria, James Jeffrey, to spin away, demanding an “enduring defeat” of ISIS while also casually claiming that “means we’re not in a hurry to get out,” and then adding that this didn’t necessarily require a long-term military presence in the country. All this in the first two paragraphs. Readers who weren’t already dizzy from hearing the press dutifully pass along the same shopworn clichés used to justify our multi-decade wars in Iraq and Afghanistan could be forgiven for having a case of journalistic whiplash as well. The AP’s muddled, one-day story was important, however, because it represented the bulk of print and online press coverage of the White House creating one more permanent front in the “global war on terror.” The New York Times, ABC News and Fox News didn’t bother to report their own stories, instead relying on the AP for their only coverage. USA Today failed to cover the news at all. Only the Wall Street Journal (9/9/18) bothered to conduct a thorough news analysis of the far-reaching repercussions of this new embrace of a military occupation of eastern Syria, highlighting the perilous journey it would set US foreign policy on once again. Despite the dearth of coverage in its news pages, the Times editorial board did, however, take the time to write an editorial (9/8/18) on the Trump administration’s new Syria policy—in order to tacitly support it. (As FAIR has previously noted—3/27/17—this move is in keeping with the Times’ long track record of supporting every overseas US military campaign for the past 30 years.) In its Sunday Review column, the paper matter-of-factly endorses the Trump plan of keeping more than 2,000 US troops in Syria as “leverage,” while also not-so-subtly echoing Trump’s “take the oil” campaign rhetoric (“Mr. Assad will have to change his behavior to get control of that area’s oil and gas resources”), the better to blackmail President Bashar Assad into complying with US diplomatic demands. As bad as the print coverage was, TV news was worse. On the all-important Sunday morning TV news shows, the new policy of open-ended commitment to military intervention in Syria barely even registered. ABC, NBC and CNN ignored the news on their respective programs. Fox News Sunday (9/9/18) spent two minutes on Syria during its interview with Vice President Mike Pence, but only to press him to promise a US military response to any Syrian government attack on the rebel stronghold in Idlib. The administration’s new “enduring defeat of ISIS” posture went unmentioned. Only on CBS News’ Face the Nation (9/9/18), which discussed Syria for all of 20 seconds, did Washington Post reporter David Nakamura briefly note, as an aside, that “there’s now reports that said [Trump has] committed now to a longer-term strategy, and it’s not going to be simple.” That was it. By contrast, the Sunday news shows gorged themselves on the anonymous New York Times op-ed story. And while its claims of an “active resistance” certainly broke new ground, there have also been plenty of previous accounts of internal staff pushback and rank Oval Office dysfunction throughout Trump’s time in office. Nevertheless, the mainstream media couldn’t get enough of this story. NBC’s Meet the Press (9/9/18) devoted a solid 20 minutes to the op-ed. (Note: the coverage on the Sunday shows often merged with coverage of Woodward’s Fear, making precise measurements difficult). Fox News Sunday (9/9/18) spent around 18 minutes on the op-ed, repeatedly returning to it across multiple interviews. ABC’s This Week (9/9/18) had roughly 15 minutes on the op-ed. CNN’s State of the Union (9/9/18): 13 minutes. CBS’s Face the Nation devoted the least amount to time—five minutes—to the Times op-ed. The time differences between the coverage of these two stories couldn’t be more stark. Out of roughly 220 minutes of high-profile TV news airtime this past Sunday, the former got all of five seconds of direct coverage, on one show. The latter, on the other hand, enjoyed around 70 minutes across all five networks. Put another way, the mainstream media devoted 840 times more airtime to the palace intrigue of the Times op-ed than to Trump’s commitment to indefinitely occupy and conduct combat operations in yet another Middle Eastern country. This level of asymmetric focus demonstrates a collective news judgment that is seriously out of whack. It isn’t just Sunday mornings, either. Syria coverage has been completely missing from the NBC Nightly News and ABC World News Tonight evening broadcasts during the past week. CBS Evening News did cover the potential humanitarian disaster in Idlib on Monday (9/10/18), but it too left out any mention of Trump’s major decision to maintain an indefinite military presence inside Syria. 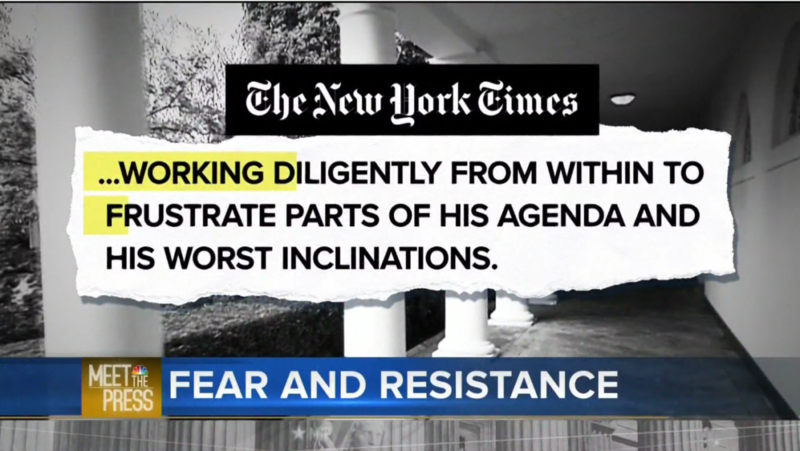 Whereas coverage of the Times op-ed swept across all three networks’ broadcasts last Wednesday, Thursday and Friday (Both NBC and ABC evening broadcasts revisited the op-ed story again on this past Monday), sometimes spanning multiple blocks of airtime (ABC World News Tonight, NBC Nightly News, CBS Evening News). Cable news was, unsurprisingly, awash in programs and panels speculating over the Times op-ed ad nauseam; Syria war policy coverage was almost blacked out. CNN (9/7/18) ran an online story on the Syria news with an admirably accurate headline—“US Envoy to Syria Says US Will Stay Until There Is an ‘Enduring Defeat’ of ISIS”—but the network notably didn’t devote any panel show debates or other on-air coverage of significance to this new Syria policy by the Trump administration. Similarly, MSNBC offered minimal coverage of Syria, and even those anchors that took the time to dig into the civil war, like Ali Velshi (9/8/18), didn’t note Trump’s 180-degree policy shift on military occupation. Do you get the sense that there will be some sort of military action taken at this point by the United States. Are we closer to intervening? She was specifically referring to military action against a Syrian government assault on Idlib in northwest Syria, but the language was still striking, as it served to disappear the reality that the US has already been heavily intervening in Syria for years now—via a CIA-funded pro-rebel campaign, two missile attacks against Assad, as well as the deployment of thousands of US combat troops and more than 100,000 munitions dropped to fight ISIS. The fact that the US has maintained a broad—and now growing—combat footprint in Syria continues to be so overlooked by the establishment press that even prominent New York Times columnists have forgotten it (FAIR.org, 9/6/18). Seventeen years after 9/11, the corporate media still finds itself overwhelmingly making the same mistakes when it comes to its war coverage: obsessing over shiny, ephemeral Beltway distractions while the most important, consequential stories get either ignored or buried. But as our nation’s military campaigns spread across even more of the globe under Trump, journalism must break free of an institutional groupthink that makes it increasingly complicit with a policy of endless war. If US soldiers are still fighting and dying and killing in Syria 17 years from now, solving the whodunit of how this tragedy came to pass won’t be that difficult; the press could start by looking at what it chose to cover this week.